After Yellowstone our next destination was a long drive north, through beautiful terrain, to Glacier National Park. Along the way Annie and I saw many incredible sights along the road and definitely had to stop a few times to take it all in. One particular spot we stopped happened to have a trail at the end of the road. We had no plans to hike this trail at all, it really came out of nowhere along a long dirt road. We got to the end of the road and off to the right was a trail, it said ‘Holland Falls 1.6 miles.’ I immediately thought to myself, jackpot! We had a quick lunch and started along one of the neatest trails I’ve ever hiked. 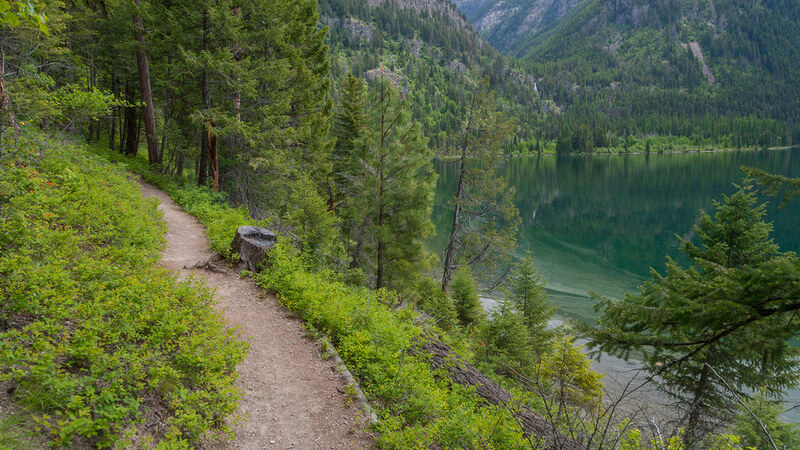 The Holland Falls Trail follows alongside, of course, Holland Lake. It’s a beautiful snow melt lake nestled in a bowl of hills at the base of the southern mountains that run through Glacier National Park. The highlight of the trip is a very large waterfall. The hike itself has a climb of about 750ft so when you reach the fall itself, you can turn around and view an incredible snow capped mountain range over Holland Lake. I was really torn between either showing that scene or this one. I felt this would put you more into place and set the scene for how great of a hike this was. All along the trail were views of the waterfall way off in the distance over Holland Lake. Along the trail were many beautiful wildflowers, Indian paintbrushes and another, very purple, flower which I could not identify. The air was crisp and cool and it was a great day to stumble upon a beautiful hidden lake and waterfall vista.